43' Nordhavn motor vessel | Christian & Co. Generator: Northern Lights 8 K.W. The vessel was inspected while afloat. Hull construction material is molded fiberglass. Deck and above deck structures are constructed of molded fiberglass. Bulkheads are constructed of plywood. Overall condition of the hull structure appears excellent with no noticeable fractures or delamination of fiberglass tabbings sighted. The exterior hull bottom was not inspected. The vessel’s weight is 60,000 lbs. * Exterior rails and hardware appear excellent. Cosmetic condition of vessel appears excellent externally and excellent internally. Vessel’s external colors are white with maroon boot stripe. Below waterline through hull fittings appear good – excellent overall but there is corrosion with a small “pin” hole in the generator’s raw water supply elbow at the through hull. The vessel is equipped with two electric/automatic bilge pumps that appear good and the bilge is holding minimal standing water. The ventilation system consists of two blowers and natural ventilation and appears good. General housekeeping appears good – excellent. The condition of the coring, in the stringers, deck, and elsewhere as applicable, is beyond the scope of this inspection. Main engine’s external surfaces appear excellent and exhibit no significant corrosion. Engine hour meter exhibits 5333 hours. Motor mounts appear good – excellent. Cooling system appears excellent (keel cooled). Fuel system and components appear excellent. Exhaust system and components appear excellent (insulated dry exhaust system). Electrical system and components appear excellent. Engine control system appears excellent and shaft log appears good – excellent with no significant corrosion. Steering control system appears excellent and rudder port appears excellent. Propulsion components appear not inspected externally. The vessel is equipped with an emergency auxiliary power “wing” engine. The engine’s peripheral components appear in excellent condition with no significant corrosion of components. Wing engine’s fuel, cooling and electrical systems appear excellent. Generator surfaces and motor mounts appear excellent. Generator’s peripheral components and systems appear excellent. Waste system and components appear good – excellent. General service seawater systems appear good – excellent except the raw water hose connector on the air conditioning raw water pump is corroded. There is a 650 gallon capacity in three aluminum tanks and one wing engine day tank located outboard of engines and forward of engine compartment. Fuel tank surfaces, where visible, appear good – excellent (minimal access) and the securing mechanism appears excellent. The fuel fill, vent, feed and return lines and components appear good. Fuel shutoff valves are located at the tanks and starboard side manifold and appear good – excellent but the center tank’s drain valve is not mechanically capped. The AC shore cord was not separated from the inlet. The AC wiring and outlets appear excellent. The AC main feeds are protected with circuit breakers. Battery arrangement appears excellent. Condition of the batteries is beyond the scope of this inspection. Batteries are equipped with disconnect switches. DC wiring appears excellent. Circuit protection for the AC and DC branch system appears excellent. Wire terminations and connections appear good – excellent. Wire organization and arrangement appears excellent. Vessel has three portable fire extinguishers with expired certification. Vessel has two 35 lb. fE241 units (fixed fire suppression systems) with expired certification. The safety components include: eight PFDs and one throwable PFD; distress flares with current certification; one life raft with expired certification; suitable first aid kit; two anchors with chain and appears good. Navigational and anchor lights appear good. Other safety equipment includes: inflatable life vest, life jacket strobe lights, tapered wood bungs, Iridium satellite telephone, Guest remote control spotlight, windshield wipers, air horn, high water alarm, Racor fuel water alarm, personal MOB alarm. Vessel is equipped with LP gas that fuels the galley range. Tank’s external appearance is good (aluminum) and they are properly secured. Ventilation appears satisfactory. Tank valves were opened and an odor was not noticed. Feed line is equipped with a reducing regulator, a pressure gauge and an electric shutoff solenoid and feed lines appear good. The vessel was inspected at its normal slip location. Line condition and arrangement appears good. Boarding hazards appear insignificant. All entry points are reportedly kept locked. Other security consists of a gated marina. The vessel is a fiberglass production long range trawler equipped with a diesel inboard engine and emergency “wing” engine. The clients reportedly purchased the vessel new and since purchase have circumnavigated the world. The vessel is actively maintained both cosmetically and mechanically and is in exemplary condition. The vessel is structurally and mechanically sound. ACTUAL CASH VALUE – $675,000 approx. NEW REPLACEMENT VALUE – $1,100,000 approx. 1. 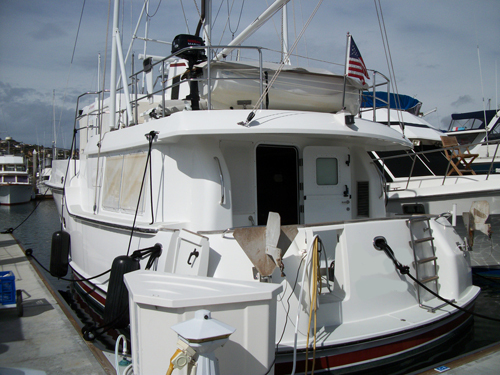 Replace the generator’s raw water supply hose elbow at the through hull due to corrosion. 2. Replace the air conditioning raw water supply hose connector at the water pump due to corrosion. 3. Mechanically cap the center fuel tank’s drain valve. 4. Separate the shore power cord from the inlet, inspect for corrosion and/or heat damage and service if/as required. 5. Have the fire extinguishers inspected and tagged as recommended by N.F.P.A.